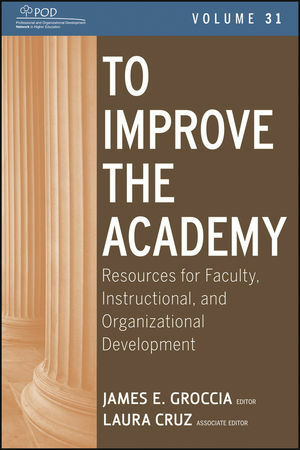 An annual publication of the Professional and Organizational Development Network in Higher Education (POD), To Improve the Academy offers a resource for improvement in higher education to faculty and instructional development staff, department chairs, faculty, deans, student services staff, chief academic officers, and educational consultants. James E. Groccia, former president of POD, is director of the Biggio Center for the Enhancement of Teaching and Learning and associate professor of higher education at Auburn University. Laura Cruz is director of the Coulter Faculty Commons and associate professor of history at Western Carolina University.